Rangers v Motherwell, St Johnstone v Hamilton, Kilmarnock v Ross County, Inverness v Partick Thistle, Dunfermline v Dundee Utd and Queen of the South v Hibs. With David Currie. of results, Aberdeen beating Dundee 3-0.
spot in the Premiership? Let's get Liam McLeod's story of the match. because of the second red card. He scored again, tapping home on 72. McDonagh won, I did not think was as clear cut. Was it excessive force? I'm not sure. Didn't seem to be an enormous complaint from Mark McGhee. at McDiarmid Park, St Johnstone cruising to victory over Hamilton. the South goalkeeper. Dundee United away to Dunfermline. Yes, it is 1-1.
from Kris Commons who had 12.4 seconds. 12.2. Something like that. higher up the park. To be honest I've been impressed by both teams. going 2-1 down. Also reassuring for command to get a couple of goals. coming, scores not only one, but two, and now they are cruising. think Partick are pretty unlucky, particularly the second half. this. We see the goals, delighted with this layup. Almost unmissable. the cup last weekend. You had him scoring twice last night, terrific. one or both of them go. You have to say that is looking quite likely. it was a hard one to go to Pittodrie. Difficult to Dundee. played when defender Richard Stearman headed in the opener. to blow up at some time. Even though that was kind of a reserve side. the 90th minute. Ross County players standing, they cannot believe it. frustrated Celtic for a long time, lost a fairly late kind of goal. continues to say, we are dominating teams but not hammering them. goal and quickly turn things round. Routine equaliser after good play. thwarted by some excellent goalkeeping by Owain Fon Williams. Superb stop from close range and fully merited at least a point. Gary Locke because the crowd was booing at the end of the stadium. they took the lead in the first and things were looking good that stage. I am hardly the scorer, his fifth goal of the season after 27 minutes. Hibs get a bit further away, difficult see them catching. stressful. Time for today's classified results. It's not stressful for them, but it is for me! Let's start with the Scottish Premiership. Let's look at the League tables starting with the Premiership. Rangers again 19 points behind Celtic. Celtic playing Hearts at Celtic Park tomorrow. At the foot of the table it's now level on points. Ayr United. League one, Livingston well ahead. Premiershipier league today so the top of the championship. Bottom of the table doesn't ever really change, does it? they can head back with their heads held high. higher. Lincoln City are in the 5th round of the FA Cup. Cup. 3-0. Hemmings has now scored in every round of this season's FA Cup. Newcastle wasted chances in the first half and then won a penalty. as ever, with a highlights show tomorrow night. Pat and Michael. See you soon. Reports and results from around the country in the SPFL. In the first Premiership Saturday since the winter break, Rangers visit Motherwell in the lunchtime kick-off, St Johnstone entertain Hamilton in Perth, Ross County make the journey to Ayrshire to face Kilmarnock and Partick Thistle are in the Highlands to play Inverness. 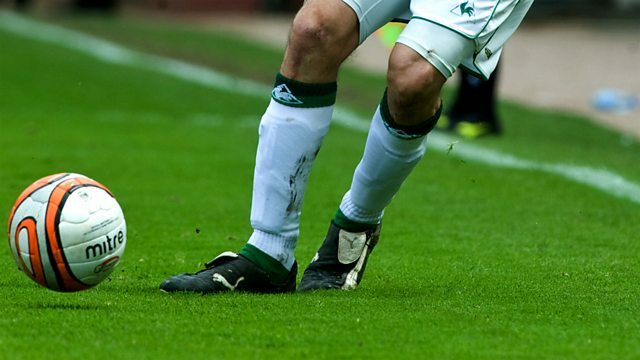 In the Championship, it's Dunfermline versus Dundee Utd and Queen of the South against Hibs. Plus action from Friday night's top-flight match between Aberdeen and Dundee.